Oxford United chairman Darryl Eales says they have been handed a "winnable" FA Cup fourth round tie after avoiding the Premier League's top four. 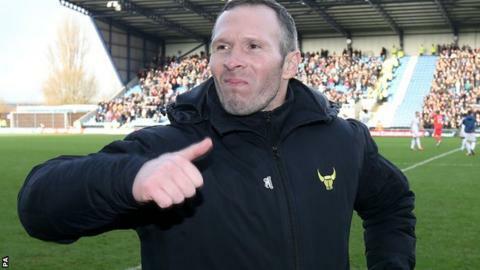 Michael Appleton's side, who upset top-flight Swansea in the third round, will play either Newport County or Blackburn Rovers at home. Oxford, currently third in League Two, are also in the southern area final of the Football League Trophy. "It'll be another challenge for the boys," Eales told BBC South Today. Oxford will have to wait to discover their opponents after heavy rain in South Wales on Saturday forced the tie between Newport and Blackburn to be postponed. "I'm sure a lot of fans will say it's not the draw we would of wanted," Eales added. "But, from my perspective, any home game against anyone other than the top four is winnable for us. "I'm sure it will be another full house and how can you be disappointed? We're in the fourth round of the FA Cup." A meeting with Blackburn would set up a reunion with former Rovers player and now Oxford assistant manager Derek Fazackerley. "I think Derek would be delighted if Blackburn get through as he's an absolute legend there," Eales said.